Services that run on a Synology are constantly being updated. Software updates for the binaries and other artifacts can quickly and easily be updated. 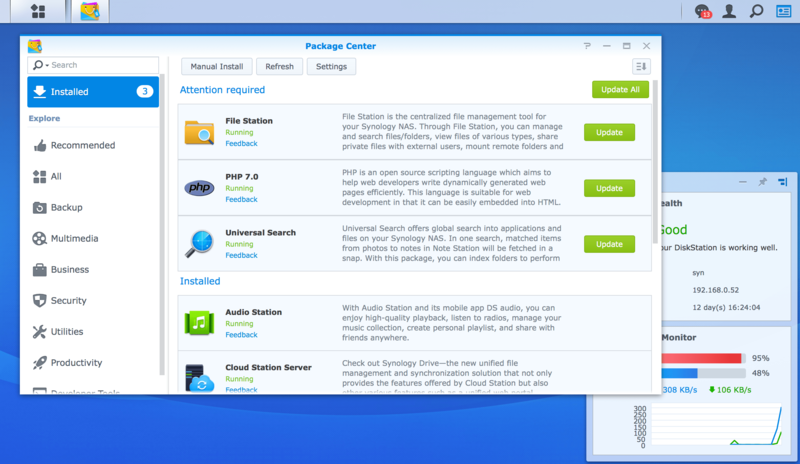 To do so, open the Synology web interface and then open Package Center. From Package Center, click Update for each or Update All to upgrade all services at once, as seen below. You will then be prompted to verify that you want to run the update. Any services that are being updated will restart and so end users might find those services unresponsive or have to log back in after the service comes back online.